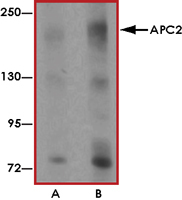 Sample Data :Western blot analysis of APC2 in HeLa cell lysate with APC2 antibody at (A) 1 and (B) 2 ug/mL. 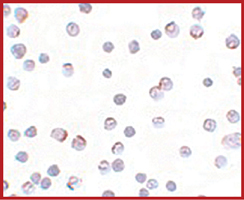 Sample Data :Immunocytochemistry of APC2 in HeLa cells with APC2 antibody at 5 ug/mL. 3. Yu H et al: Identification of a cullin homology region in a subunit of the anaphase-promoting complex. Science1998; 279:1219-22. 4. Zacharie W et al: Mass spectrometric analysis of the anaphase-promoting complex from yeast: identification of a subunit related to cullins. Science1998; 1216-19.